ODOT and Local 55 make Ohio history with the first Ohio Slide Bridge. The United States Department of Transportation Federal Highway Administration has been promoting a program called Every Day Counts and part of that program is the initiative for Accelerated Bridge Construction (ABC). 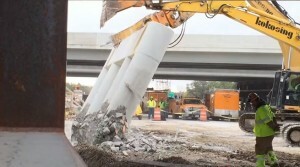 Through this program, the Ohio Department of Transportation implemented the first Slide-In Bridge Construction (SIBC or ‘lateral slide’) in Toledo. The construction of the first Slide Bridge began on October 16th and lasted 3 days. This was a huge initiative by the ODOT District 2 to replace the Southbound bridge of I-75 over US Route 6. Traffic being redirected in preparation for construction to begin. Demolition of the old bridge to prepare for the new construction to be slid into place. Historic action for Local 55 and ODOT in the first Ohio Bridge Slide. You can watch the YouTube video from ODOT on I-75 Slide in Place Bridge.